Last night I made pesto for dinner, my mom & I are obsessed with it. 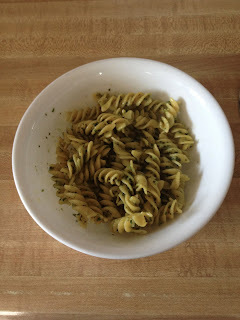 The best time of the year to make pesto is summer because it is easy to find the fresh herbs, I still make it in the colder months but I usually have to run around to find some of the ingredients. I got this recipe from a friend & modified it so it is nut free, as I am allergic to nuts. This recipe not only tastes amazing, but smells amazing too, last night our entire kitchen smelled of parsley & basil, which I loved. *I used Wegman's Brand Gluten Free Fusilli, as my sister & I cannot have wheat. -Rinse & dry basil & parsley. -Put basil, parsley, garlic, & parmesan in a food processor. Pulse ingredients in the food processor until ground. Do not ground too much. -Add olive oil & pulse until it is the consistency of soft butter. -Cook pasta to your liking, & drain. -Pour pesto over pasta & mix well. How to Put Glitter on Everything!